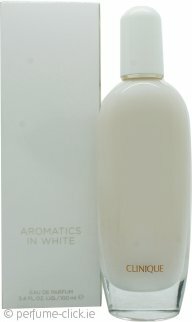 Aromatics in White by Clinique is an oriental and floral fragrance for women. It contains notes of Sichuan pepper, elegant violet leaves and labdanum, roses and orange blossom, patchouli, leather musk, grey amber, benzoin and vanilla. Aromatics in White by Clinique was launched in 2014.